Having retired early the previous night, we managed to get up at a reasonable time for breakfast, and then a short wander round Audinghen, before packing everything back into the car (something we would become very adept at over the next fortnight! ), and heading South again. We stopped in Ambleteuse to visit the Musée 39-45, which houses a comprehensive collection of WW2 material. 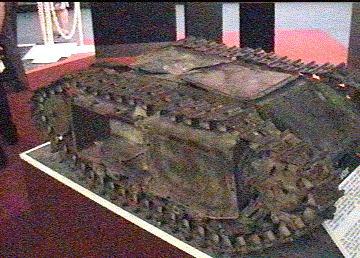 German "Goliath" explosive tank, remotely operated by either a command wire or radio control. In the event of the expected Allied invasion, they were intended to be driven towards attacking troops and detonated, but eventually none were known to be used operationally. 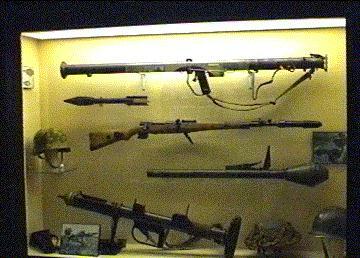 Collection of German small arms. 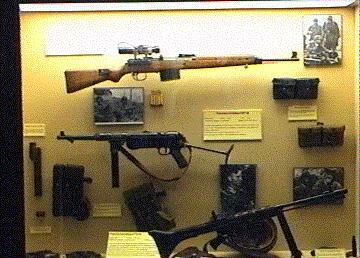 Apart from the familiar MP38/40 machine-pistol [centre], the Karbiner 43 [top] and Fallschirmjaeger Gewehr ("Paratroop Rifle") 42 [bottom] were significant steps towards the modern assault rifle. Anti-tank weapons: American 2.36" M1 Bazooka with rocket; German Gewehr 98 rifle with grenade, and Panzerfaust ("Tank Punch") disposable rocket projectile; and British PIAT (Projector Infantry Anti-Tank) mortar. 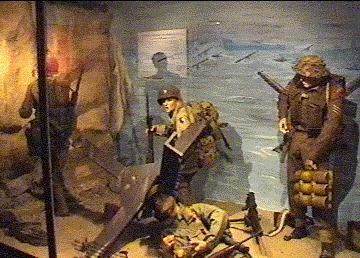 Diorama of Allied uniforms and equipment used on D-Day. Other displays at the museum show all the other theatres of the War, as well as an evocative recreation of a street in German-occupied France. South of Boulogne, we reached what was actually the real impetus for the whole holiday. The town of Etaples was a concentration point for British forces during the First World War, where troops were trained under brutal conditions (leading to the mutiny which inspired The Monocled Mutineer), while casualties from the frontline were treated in sixteen military hospitals there. My great great uncle - my maternal grandmother's uncle - Joseph Carr, a driver in the Royal Army Service Corps, died of wounds on 8 July 1917, and is buried in the Etaples Commonwealth War Graves Cemetery. In that respect, our family is fortunate when one considers that half of those who fell in WW1 have no known grave. 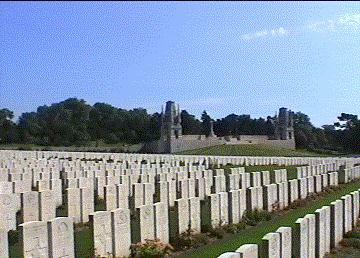 The Cemetery contains nearly 11,000 1914-18 casualties, and over 100 from the 1939-45 War. The graves of Commonwealth service casualties, with their distinctive white headstones, can be seen in virtually every graveyard in the UK, but this was my first visit to an actual War Cemetery, and - to the best of our knowledge - this was the first time any members of our family had made this journey. Even when one has no such personal connection, it is impossible not to be deeply moved by these places. To describe them as immaculate would be an understatement, and the contrast with civilian cemeteries is both striking and poignant. Awash with a myriad of colours from the perfectly-nurtured flowerbeds which bisect the rows of headstones, what is evoked is a kind of tranquil vibrancy, peaceful yet retaining a sense of life continuing after death that one can almost touch. These cemeteries - administered by the Commonwealth War Graves Commission - have no staff on-site, so it is rare to see anyone else around, barring the occasional visiting maintenance team. The paths leading into the cemeteries are almost always grassed, a subtle yet necessary psychological device: once one has unavoidably walked on grass to go onto the cemetery, subconsciously one is not inhibited by then walking on the grass between the graves. At first glance so uniform in appearance, the headstones imbue a real sense of individuality upon closer inspection. In addition to name, rank, and serial number, each is engraved with either the appropriate regimental badge, service insignia, or national emblem (e.g. a Kiwi for New Zealanders, a maple leaf for Canadians, etc. ), as well as a religious marker, be it a Cross (two designs dependent on placement of regimental insignia), a Star of David, Sikh, Hindu, or Muslim inscription, or nothing at all. Perhaps most importantly, the base of the headstone frequently carries a personal inscription from family or sometimes friends. Often one sees other individual remembrances left by previous visitors: poppy Crosses or Stars of David, wreaths, messages, photographs, pebbles on the headstones, flags of nations, or provinces, or towns. Some seem new, many have weathered many summers and many winters, respected by those who tend these places because they must be, whether someone came ten miles or a thousand to leave them. To clear them away is not an option. At first glance, what appears merely a mass of impersonal stone, gives way to real individuality and a true sense of loss and remembrance. Within the Cemeteries there is also a national inclusiveness which may surprise many first-time visitors. Amid the predominance of Commonwealth headstones, one can easily pick out the appropriate designs for other countries. Just as the Commonwealth markers reflect the individuals they commemorate, so there is an acceptance of other national identities. Thus, for example, a Pole, Italian, or German, perhaps visiting purely by chance, will be able to find the graves of their compatriots, tended with the same care as the rest, be they ally or enemy at the time of war. The Commonwealth War Graves Commission web-site (http://www.cwgc.org/) now contains location details of all graves the care of which falls within its remit, as well as the memorials bearing the names of casualties who have no known resting place. Virtually all the Commonwealth Cemeteries also have a Register on site - usually in a small lockless "safe" (which also contains the Visitor's Book) near the entrance - with details of all those there commemorated. Unlike some other nations, which choose to concentrate most of their casualties in a small number of large cemeteries, the Commonwealth practice is to leave the graves where they were buried, except when regular maintenance cannot be assured. Thus, while there are a number of very large cemeteries like Etaples all over France, one can also see many much smaller sites - some with as few as twenty casualties - as well as individual graves in town and village churchyards and cemeteries, the principle being to allow them to remain within the communities which originally took them into their care. In addition, most WW1 sites were later used for WW2 burials, whether for downed air-crew, or Allied casualties of fighting in the immediate vicinity. Etaples Cemetery. 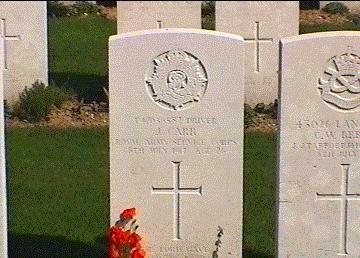 The grave of my great great uncle, Joseph Carr. A WW1 Belgian grave - unusual in this part of France. WW2 Czech grave . 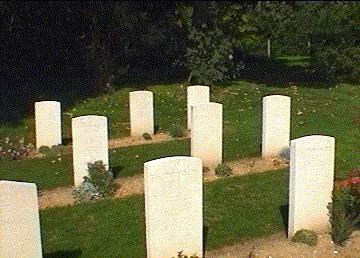 WW1 graves of soldiers of the then-Undivided India. 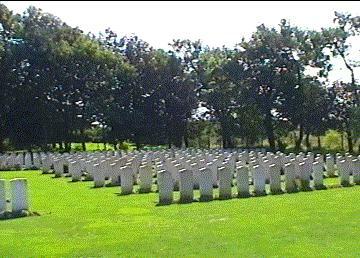 One of Etaples Cemetery's two German sections. "The interest of official British war cemeteries is quite different from that of country churchyards back home. There is no variety in craftsmanship, no curiosities of the monumental mason's art, no charmingly naive or vulgar effigies. All is uniform, and disciplined by an austre conception of architecture, humanied by nature and by subtle landscaping. Sentimentality, and the over-emotionally figurative in art, were rigorously suppresed by common consent... 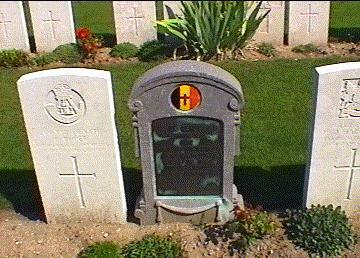 But, above all, the unique quality of the British cemeteries comes from the repetition of standard, secular headstones. 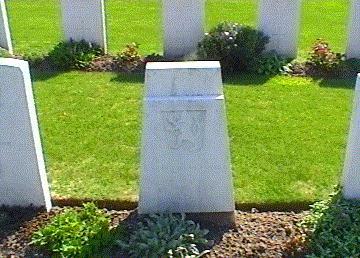 Here the Commission prevailed over the wishes of distressed relatives, for it was established that no bodies would be taken home for reburial (a principle betrayed by the Prime Minister after the Falklands War), that all ranks should have stones of equal size, and that this standard headstone should not be in the shape of a cross (although a cross, or other religious symbols, together with regimental badge, could be carved on it). The irony is that, for Britain at any rate, some of the finest artistic expressions of the period in terms of architecture and landscape gardening are to be found in France and Belgium and on other far-flung battlefields in cemeteries and memorials. The purpose of these was to commemorate the dead; now, they also serve as a memorial to the civilization that engendered such quality, and which was yet so damaged in the conflict. Surely no one with an eye and a heart and a tragic sense of history can fail to be moved by these places."